Rafters are spaced at 600mm centres and it is important to try to get as close to this as possible to avoid having to cut the sheets of plywood. 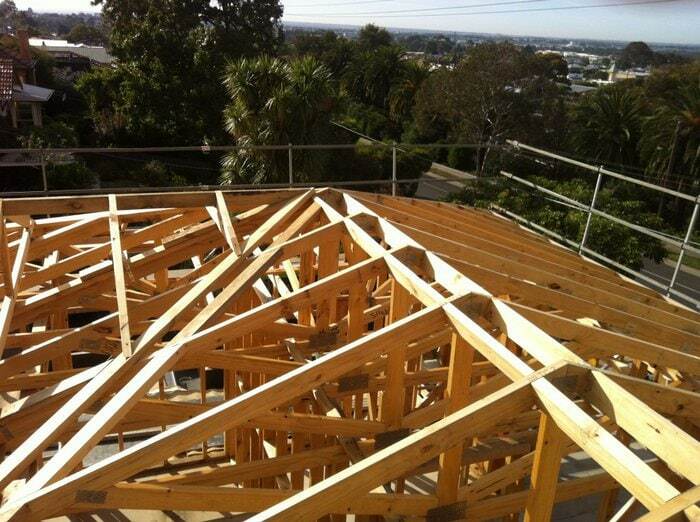 15mm A-Bond plywood is used for rafters at 900mm centres. The thicker plywood material provides additional strength to span further – as per Australian Plywood Standards. There are a few simple things that need to be done before we can install our plywood base. We have to check that the entire roof is level. This is achieved by either using a straight edge or string lines. A tolerance of 5mm every 4000mm is acceptable. Unlike a tile roof or corrugated metal the flat appearance of the roof shingles will show any movement in the rafters. We then noggin down the middle of the valley. This supports the plywood which prevents the underlay and roof shingles from moving causing it to tear and rip. A single noggin will suffice as long as the plywood materials can be nailed down from both sides. We noggin the ridge 100mm back from the centre on both sides. This provides support for the ply, shingles, ridge ventilation and capping shingles (see below). Ventilation of an asphalt shingle roof system is essential. We need to provide equal amounts of inlet ventilation and outlet ventilation. We achieve the inlet ventilation at the lowest point of the roof, just above the fascia. A 10mm air gap is created around the entire perimeter of the roof. 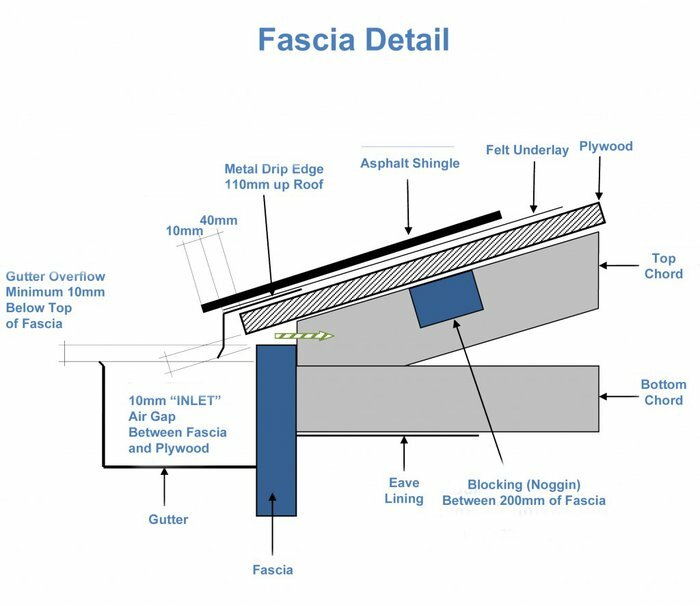 The fascia will generally be lower than with other types of roofs materials and the gutter height needs to be adjusted accordingly. The outer edge of the gutter needs to be lower than the top of the fascia to avoid water entering the home (see below). These photos show the detail of the fascia and barge’s. Manufacturers Brand or Name, The word ‘Structural’, face grade, back grade and bond, (e.g. CD-A Bond), Stress Grade, (e.g. F11 or F14), the Australian /New Zealand Standard AS/NZS2269 and the PAA/JAS-ANZ product certification brand stamp. Look for this certification brand stamp to give yourself piece of mind. Imported plywood will generally arrive with a different moisture percentage. When this changes to local conditions the ply can de laminate, shrink and even twist and warp. We had to replace an entire roof years ago and you only want to do this once. The plywood is installed with 70mm framing nails every 150mm along the rafters. The nails should be staggered between the vertical joins in the plywood. This is a “high wind zone” application. We use tongue and groove A-Bond structural plywood as this gives the base the strength that is needed for the other roof materials. The vertical join or short edge requires a 2mm gap between the sheets. This allows for any expansion in the timber. The tongue and groove should but together tight as the gap is machined into the ply during manufacture. Felt underlay is then installed over the plywood base. Staples are used to hold this roof material into place only until the shingles are installed. On the vertical joins we overlap 100mm and on the horizontal overlap it it 50mm. On pitches below 18.5° we can use a double layer of the saturated felt underlay to manufacturers specifications. The underlay is felt paper coated in asphalt saturant on either side. 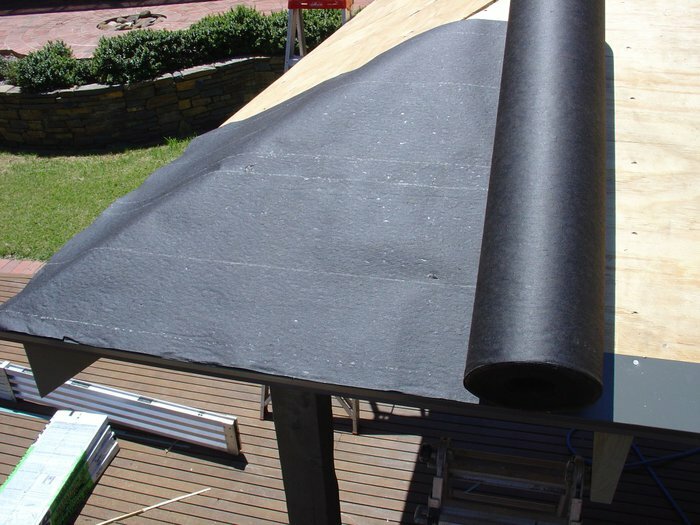 Underlay protects the roofing shingles from anything that is released from the plywood. Underlay provides a secondary barrier from wind driven rain. Underlay can flatten out and irregularities in the ply cladding. Underlay is required to receive the ASTM E108 – Class A Fire rating on a fiber-glass shingle. See� ARMA Form No. 219-RR-89 (1993) or CASMA Technical Bulletin No. 3 (1992) for more information. The valleys are lined with a thick adhesive backed rubberised membrane roof material called Armourguard. This provides a fantastic waterproofing barrier, sealing around nails (see below). We install a flashing which extends into the gutter called a “drip edge”. The drip edge should run 40mm into the gutter from the outside edge of the fascia. It should also run up the roof around 100mm protecting the leading edge of the plywood material from water damage. Over years the plywood can rot if no drip edge is used. Asphalt roof shingles are installed with 10mm wide head / ribbed shank galvanised clout nails. Staples can not be used to install roof shingles as they can cut through the shingle and over time they tend to work their way out of the plywood cutting the roof shingle above. Nail position is just below the glue strip and above the cutout on the Marathon roof shingles and on the guide line on Laminated ranges. The clouts should be nailed as in the diagram above. Flush with the asphalt shingle. The clout should penetrate at least 2mm through the plywood as suggested by the ARMA. Ribbed shank nails are preferred as they have better holding strength. See� ARMA Form No. 221-RR-93 (1994) for full details. 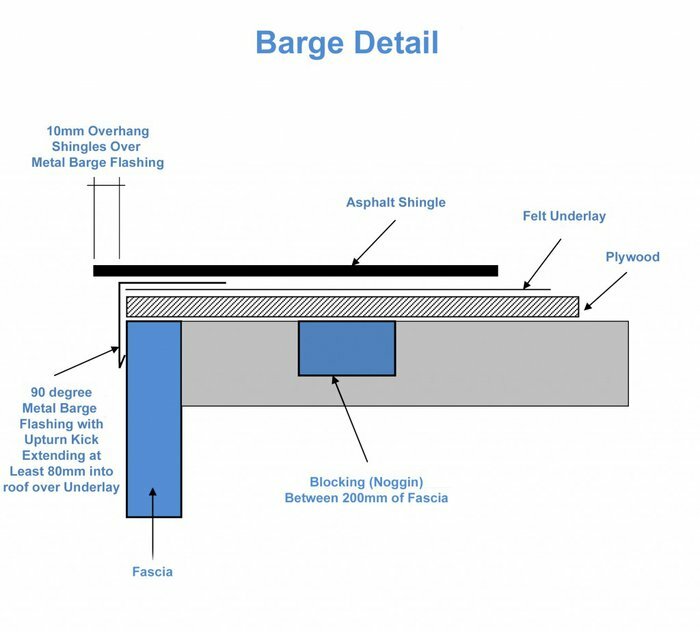 Metal step flashing is used where the roof joins up to a vertical wall or penetration. For example a skylight, chimney or air conditioning unit. The metal step is nailed over each course of asphalt shingles guiding any water out onto the main roof. This flashing is then covered by the wall cladding. 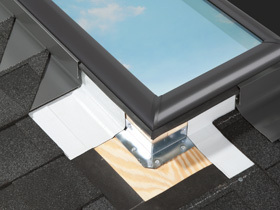 The Velux range of skylights can be ordered with a step flashing kit for use with roof shingles. Ask for thew EDL step flashing kit when you order. Probably the most important installation consideration is proper ventilation. The amount of ventilation needed is determined by the size and design of the roof. For attic spaces above an insulated ceiling, the vent ratio is one square meter of net free ventilating area/300 square meters. For low slope roofs or cathedral ceilings the vent ratio is one square meter/150 square meters. Our premium ridge ventilation is used for the exhaust ventilation. The natural effect of the hot air rising pushes it out through at the highest point in the roof. Also a venturi effect is created where the outside wind pulls the air from the roof. Box vents are not adequate as they don’t provide enough net vent area. A typical sized roof would need 20+ box vents which is unrealistic and very ugly. The picture below shows what can happen if some of the manufacturers requirements are not followed. You can see where the ply has rotted and the roof shingles have deteriorated. This was mainly caused by the roof had no roof ventilation installed. The bathroom exhaust was vented directly into the closed roof space causing moisture to build up and rot the plywood. Roof ventilation performs a number of important tasks in an asphalt shingle roof system. Condensation can occur on the inside of the ply deck due to the difference in the air temperatures in the roof and outside. Ventilation will stop this from occurring saving your roof and insulation from being damaged. Also stops the ply from rotting. The proper use of roof ventilation will add years to the life of your roof. Some manufacturers will void the warranty is the recommended roof ventilation is not followed. More details on the importance of roof ventilation can be seen in the articles below. See ARMA Form No. 209-RR-86 (1994) or CASMA Technical Bulletin No. 1 (1992)for more detailed information. We use a premium ridge vent called Trimline. It provides good exhaust ventilation and has a nice low profile appearance. In some hip roof designs there is little to no ridge for roof ventilation. In these situations we can use a solar powered electric vent (see below) These solar vents are brilliant at pulling the hot air from the roof during the day. When the sun goes down the vent stops running and leaves some of the heat in the roof space. 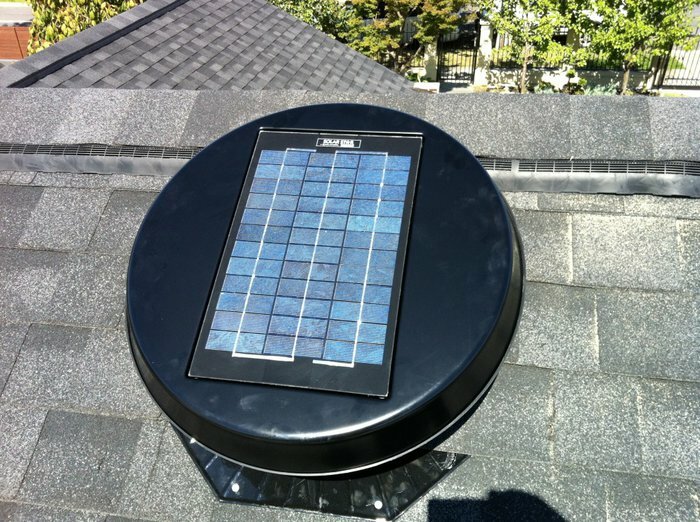 One solar powered roof vent is equivalent to 12 “whirlybird” roof ventilators. A lot to take in and understand I know but it pays to have this knowledge to build the best possible asphalt roof shingle system available that will protect your home for many years to come. To go over any of these roof installation techniques or to learn more about how to build a house in asphalt roof shingles please call one of our experienced asphalt shingle roofers.